Can Spitzer Take The Heat? He said Friday he was standing by the plan for now, but he suggested he might consider backing off if he could not build enthusiasm for it, the reports said. Spitzer claims giving driving credentials to people now "living in the shadows" would make traffic safer. That's the same justification offered by those who allowed illegal aliens to drive in Tennessee. Spitzer's driving illegals program has become a national issue and a hot topic in the presidential campaign. Even Democrats can't understand why their party's national leaders are embracing driver's licenses for illegal aliens, and say their constituents see it as a "de facto amnesty." Alabama Democrat Representative Artur Davis, said voters in his state "get that a driver's license is a form of legal status" because it can be used to board a plane, enter most government buildings and conduct most financial transactions. "The American people don't want conferring driver's licenses to become a de facto amnesty," he said. Kansas Democratic Representative Nancy Boyda, Kansas Democrat, said the stance favoring licenses for illegals taken by Democratic presidential candidates is very unpopular in her district. "It is ultimately about the rule of law," she said. "We don't give driver's licenses to people who are here illegally. We do something about the fact that they are here illegally." Texas Democratic Representative Nick Lampson, said "Somebody else might be out of step with the voters of my district, but I'm not." Driving illegals has exploded as a major issue in the presidential campaign thanks to New York's Liberal/Progressive Democratic Governor Elliot Spitzer's very unpopular proposal to give licenses to illegal aliens and Hillary's inability to say whether she supported Spitzer's proposal at the Drexal University debate. In addition to Mrs. Clinton, Sen. Barack Obama of Illinois said he favors licenses for aliens while New Mexico Gov. Bill Richardson's state is one of the small number that already allows such licenses. A recent Fox 5-Washington Times-Rasmussen Reports poll found 77 percent, nearly a five-to-one margin, oppose drivers' licenses for illegal aliens, including (88%) of Republicans, 75% of unaffiliated voters and even 68% of Democrats. The people get it. Unlike the Democratic Presidential candidates, voters understand that an incentive like a driver's license will encourage more illegal aliens. Tennessee stopped issuing driving certificates to illegal aliens after investigations found illegal aliens were being shuttled to Tennessee from other states, using fake residency papers and sometimes bribing state workers to get the driving certificates. Tennessee's Driving certificates for illegals, like Spitzer's licenses, were meant to improve driving safety by making sure immigrants living in the state knew traffic rules. "I'm concerned that making licenses available to illegal immigrants could present security risks, make New York a magnet state for illegal immigrants by creating an incentive for more undocumented individuals to come to New York, and that the proposal would create a bureaucratic, confusing system," Hall said in a statement after he was criticized on the issue by national Republicans. Even though some Democratic members of Congress see the silliness of providing incentives that encourage more illegal immigration, it's only the Republicans that are trying to stop driving illegals. Minnesota Republican Senator Norm Coleman, introduced a resolution that would put the Senate on record condemning states issuing driver's licenses to illegal aliens. Coleman's resolution is co-sponsored by 15 Republican Senators. New York Republican Representative Peter T. King of Long Island plans to introduce legislation next week that would prohibit states from issuing driver’s licenses to illegal aliens. Driving illegals is more problematic than just encouraging more illegal immigration. A driver's license is more than a permit to drive. It's a nationally recognized form of identification that implies citizenship. With the license comes an assumed legitimacy. The same legitimacy achieved by the 9/11 hijackers, who had dozens of state IDs, used to rent cars and apartments, open bank accounts, take flying lessons and board planes. Instead of arresting and sending illegal aliens back to where they come from when they are discovered driving illegally, the liberal/progressive solution is to give them driver's licenses. I just don't get it. Seventy-seven percent (77%) of American adults are opposed to making drivers licenses available to people who are in the country illegally. The results won't surprise anyone except the Liberal/Progressive extremists that have taken over the Democratic Party. Eighty-eight percent (88%) of Republicans oppose giving drivers’ licenses to undocumented immigrants. So do 68% of Democrats and 75% of those not affiliated with either major political party. There is little difference along gender, age, or income levels. I have said before, we should trust the people on immigration reform. The people get it. They intuitively understand that it is stupid to give someone known to be here illegally a license to drive. The poll numbers are the real reason Hillary refused to give a straight answer about New York Democratic Governor Elliot Spitzer's very unpopular proposal to give licenses to illegal aliens. The same analysis applies to the misguided Liberal/Progressive proposal to provide instate tuition breaks to illegal aliens contained in the so-called Dream Act. Fifty-nine percent (59%) of all voters oppose the concept of the Dream Act. On the left coast, 62% of California voters support Republican Governor Arnold Schwarzenegger's veto of the state version of the Dream Act. Providing any sort of "sanctuary" only encourages more illegal immigration. Presidential wannabee, Connecticut Democrat Senator Chris Dodd, says he will block a Senate vote on a White House-backed terrorist surveillance bill. Dodd's move would stall a measure that President Bush and Director of National Intelligence Mike McConnell have said is essential to protect national security. As I have posted before, I still don't find the Terrorist Surveillance Program very bothersome. We are at war, even though too many pretend we are not. I like the idea that someone is keeping an eye on suspected terrorist communications. Thanks to directorblue at the Doug Ross Journal for the tip. 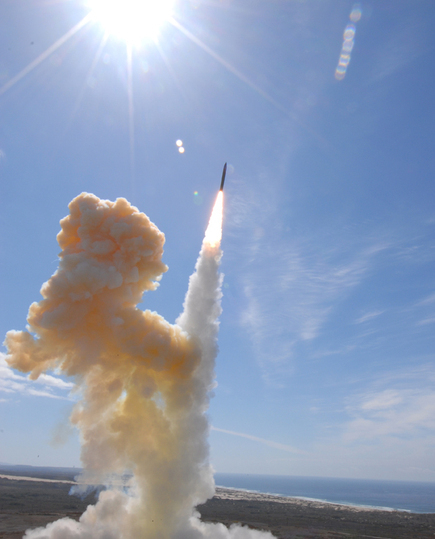 The test marked the sixth successful downing of a target in 10 full-fledged intercept tests since October 1999 in which knocking down the target was the primary objective, said Richard Lehner, a spokesman for the Missile Defense Agency. Force Base, Calif. The threat-representative target missile was launched from Alaska's Kodiak Island. The Bush administration is building a layered shield to thwart ballistic missiles from countries like North Korea and that could be tipped with chemical, germ or nuclear warheads. Star Simpson, 19, had a computer circuit board, wiring and a putty that later turned out to be Play-Doh in plain view over a black hooded sweatshirt she was wearing, said State Police Maj. Scott Pare, the commanding officer at the airport. Massachusetts state troopers tracked down the pretend suicide bomber outside Terminal C, where they arrested her and later determined the device was a fake. I thought you had to be really bright to go to MIT. What a dumbass! Newsweek's Michael Isikoff and Mark Hosenball, weigh in on the scathing CIA Inspector's General Report the CIA didn't want us to see. What did I do? What did I do? I worked hard to try to kill him. I authorized a finding for the CIA to kill him. We contracted with people to kill him. I got closer to killing him than anybody has gotten since. So now we can see why Clinton went nuts when asked if he did enough to get Osama bin Laden - he knows he did not do enough. In case you want to review the whole sorry Clinton meltdown, a YouTube video of the Wallace interview can be watched below and the FoxNews transcript is available here. My post refuting Clinton's Clarke Defense is here. A post about Chris Wallace's reaction to Clinton's temper tantrum is here. No matter how many times I watch that video, it always make me think of Clinton getting on national television, pointing his finger at the camera and saying "I did not have sexual relations with that woman..."
Police confirmed the increased security was in response to receiving information that a dirty bomb may go off on Friday evening around 34th street in Manhattan -- a neighborhood with the Empire State Building, New York City's tallest building, Madison Square Garden and Macy's department store. New York City police said in a statement the threat against the city was an "unverified radiological threat," stressed the increased security was precautionary and said the city's alert status for an attack was unchanged at "orange." There is also a message which speaks obliquely of the approaching attacks easing the heavy pressure America exerts on countries like Japan, Cuba and Venezuela. 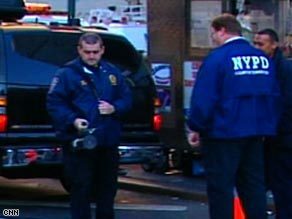 The New York Police Department has increased the deployment of radiological sensors on vehicles, boats and helicopters, and had set up vehicle checkpoints in lower Manhattan's financial district and at bridges and tunnels. "New York City knows how to deal with a [dirty bomb] better than any other city in the country," says former Police Commissioner Howard Safir. The initial blast kills only a few dozen people, but radiation is quickly dispersed by the prevailing winds. Minutes after the explosion, New York City Police officers arrive -- still unaware of the real nature of the blast. But when a radiation detector in one officer's car goes wild, it becomes clear that a dirty bomb has detonated in the financial center of America's biggest city. Word of the explosion reverberates throughout New York. Many residents panic -- despite assurances from the mayor and police chief that contamination levels would exceed government limits only in about 40 city blocks. And by 3 p.m., half of Manhattan has tried to leave, clogging trains, highways, and bridges. Six months later, the financial district remains largely off-limits, and the local economy is limping along amid a cratering of business confidence, the collapse of the tourism industry, and a property market in free fall. Economists put the eventual economic losses at an astronomical $1 trillion. Can you say Jose Padilla? UPDATE: The New York Post reports the NYPD mobilized hundreds of anti-terrorism cops last night in response to the "dirty bomb" threat targeting the city. According to CNN, The FBI, Department of Homeland Security, and New York Police Department insist the threat is unsubstantiated. More at Captain's Quarters and Riehl world View. UPDATE II: More coverage at One Jerusalem Blog and Atlas Shrugs. Two and one half years after the New York Times revealed the government's formerly secret Terrorist Surveillance Program, there is finally some evidence that the FBI is on the trail of the leaker. The lawyer, Thomas M. Tamm, previously worked in Justice's Office of Intelligence Policy and Review (OIPR)—the supersecret unit that oversees surveillance of terrorist and espionage targets. The agents seized Tamm's desktop computer, two of his children's laptops and a cache of personal files. You may recall that the Times was accused of revealing the Terrorist Surveillance Program in order to sell a book. Even the Washington Post took the Times to task for revealing the program. I still don't find the Terrorist Surveillance Program very bothersome. We are at war, even though too many pretend we are not. I like the idea that someone is keeping an eye on suspected terrorist communications. Additionally, anyone who assumes e-mail or cell phone conversations are private, needs a reality check.